Welcome to Ixtapa and our little slice of paradise! The Amara is a privately owned luxury beachfront condominium resort. This luxury 2200 sq .ft. unit provides amazing views and spectacular sunsets, while the calming sound of the ocean waves will sooth you to sleep every night. The Amara has the best location on the beach, and is just a few steps away from great restaurants, shopping, local markets, grocery stores, movie theatre, and the unique Ixtapa nightlife! The Amara is just 10 minutes away by cab from Zihuatanejo, and only 20 minutes from the airport. No need to rent a car as everything is easily accessible by foot or by a short taxi ride. Our unit is located on the 10th floor, is one of only 90 within this quiet, gated complex, with 24 hour security. Being on the 10th floor offers spectacular 180 degree views of the ocean and coastline, with mountain and golf course views out the back. Tastefully decorated, our unit is finished with the highest quality materials. The main living/dining room area has floor to ceiling glass doors that slide open on to your private balcony. The living room has a 55' LED TV, DVD player, Xbox gaming system, Apple TV with Netflix and our personal WiFi for your enjoyment. The balcony has a patio table for 4 and a comfy seating area with a couch, two swivel chairs and table. the perfect area to enjoy the sunsets or drink your morning coffee. The three master bedrooms (two on the ocean side - bedroom 1 & 2 and one on the mountainside - bedroom 3) all have king size beds and attached ensuites. Bedroom 4 on the mountainside is uniqually equipped with a queen bed, a twin bed and a second lofted twin bed - perfect for the children. Both mountainside bedrooms are outfitted with dual pane windows to reduce the evening noise to ensure you have a comfortable undisturbed sleep. Bedroom #5 is located off of the kitchen and is equipped with a queen size bed and has an attached half bath. Each bedroom has it's own private bathroom and all have control of their own air conditioning unit. The owners master bedroom has a 47" LCD TV with DVD and Apple TV with Netflix. The second ocean side bedroom has a 46" LCD TV and DVD with Netflix and apple TV. In total, the unit can sleep 12 comfortably. All towels and linens are provided, and daily maid service is available on request. A child's playpen and high chair are also available. Your kitchen is fully equipped with first class stainless steel appliances - gas oven/range. dishwasher, and double refrigerator w/ filtered water and ice. Additional appliances include: microwave oven, coffee maker, toaster, blender, as well as all the utensils, plates, pots, pans, etc... needed to satisfy the cook in your party. Or just walk across the street to any of the many excellent local restaurants available for your dining pleasure. The beautifully landscaped grounds include three pools - one huge pool with beach style entry for families, another infinity pool for adults only, and a small wading pool for kids. Guests can enjoy very reasonably priced drinks and snacks at the palapa bar. Walk down just a few steps and through the private gate out to one of the most beautiful beaches you will every see, where private palapas and lounge chairs await you for a relaxing day on the beach. A personal chef and daily maid service can be arranged when you arrive on site for an additional charge. Other amenities include: paddle ball courts, fitness facility, private parking stalls, and a business centre. Free Wi-Fi wireless internet service is provided throughout the property. We welcome you and hope that you enjoy our little slice of paradise as much as we do! * Our unit can accomodate a maximum of 9 adults and 3 children (12 and under). There is an extra nightly charge for each person over 8 guests. * A resort fee (also known as a bracelet fee) of 300 pesos + tax (16%) per person for the entire stay is EXTRA and is due to the condominium administration at your arrival. This fee is not included in your rental fee. This fee can be paid by Visa or MasterCard upon arrival. I own my own business in Calgary Canada. My family and I love to come to our home in Ixtapa and we visit here often. We enjoy sharing our home with family and friends. We chose Ixtapa for the weather (a very consistant 30+ degrees year round!) and we chose Amara because of the individual unit sizes and its location in Ixtapa. You can't beat Amara's location - directly off the main area of downtown Ixtapa and in the middle of Ixtapa beach. We travel with our 3 children and we have found it very difficult to find accomodations that suit our lifestyle and provide us with enough individual space to truly relax. We like the comforts of home and what better way to have them when you travel then to have your own place. We have outfitted our unit with many upgrades and with only the finest furniture and beds for our casa. We like the conveniences that TV and WiFi bring and I love to send my business associates views from my 'office' when i'm working remotely from the balcony in Ixtapa! toilet, shower, His and Her sinks. toilet, shower, Single Sink. Bathroom is accessed off the main hall. Attached half bathroom with toilet and sink. The master and 3 guest guest bathrooms have a combination adjustable shower wand and fixed rain shower head. extra storage cabinet space for toilettries and towels. Hair dryers are not guaranteed. 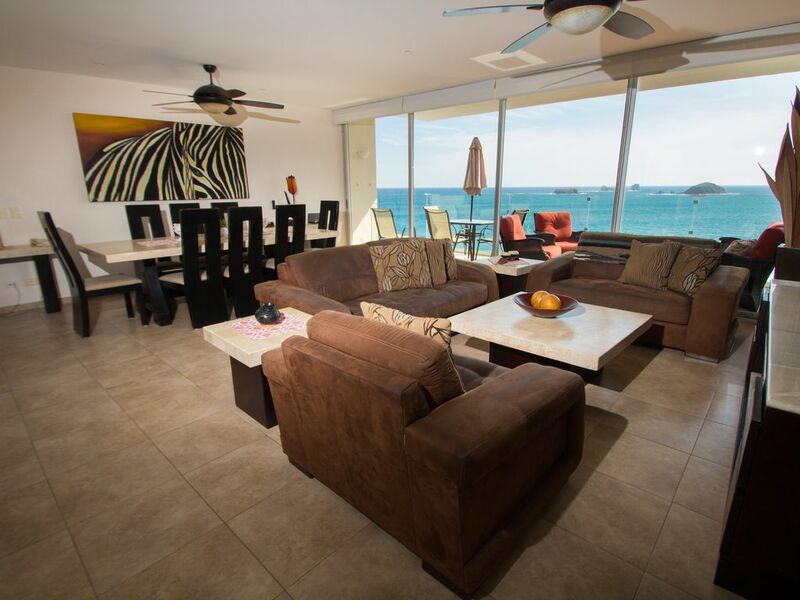 Located right on the beach in the midle of Ixtapa Beach. A beautiful 180 degree view of the Pacific Ocean from our 10th floor unit. All bedrooms have personal remote controlled air conditioners. A patch cable is available to connect your laptop to the router for better signal strength. Beachtowels are supplied and must be the only type of towels used at the pool and beach area. Shared fitness facility on main floor. Universal weight machine, treadmill, cycle, elliptical and free weights. Air conditioned area. Stainless steel, below counter standard dishwasher. Stainless Steel Dual door, freezer refrigerator with drinkable water and ice maker with dispenser. Highchair is available for a nominal rate. (3) Internet TV (Apple TV, Netflix) are available in Oceanside bedrooms #1 & 2 as well as living room. DVD players are available in Oceanside bedrooms #1 & 2 as well as living room. No DVD's are provided. Various books for your use. Some board games are available as well as playing cards, however they are not guaranteed to be there. Some pool and beach toys can be available. Boogie boards can be available. All items are not guaranteed. Video games are NOT provided. A glass dining table complete with umbrella and 4 chairs. A cushioned couch with coffee table and two sway chairs are on the patio as well. Boogie boards, pool floats, some snorkleing gear, sand toys are available to use. Two paddle tennis courts are on the premises. 3 Pools are available for your enjoyment. The child's wading pool is 18" deep. The large family pool has a beach type entry and is 3'-5' deep. The adults only pool is 5' deep and has an infinity edge. Your place is everything you could hope for. Beds are incredibly comfortable, deck and views beyond amazing. We were 12 and didn’t feel on top of one another at all. Loved it. Thank you Jason for being so easy to deal with an accommodating. Met the neighbors who have been there 7 times and know you and they were super nice and helpful as well. This is our second time staying at Amara in this condo. The unit itself is amazing. As soon as you walk in the glass wall from floor to ceiling takes your breath away. The view of the ocean is spectacular! The deck is large and comfortable with a table for 4 to eat and 2 rocking/lounge chairs, a couch and a table. We spent a lot of time on the deck in the morning and again at night. The bedrooms are large and the beds are sooooooo comfortable! I like the mattress in this unit better than my mattress at home! The bathrooms are beautiful and nice sized for a family. We are a family of 4 and only used 3 of the bedrooms and bathrooms. We bought groceries and cooked all of our breakfasts and lunches and then went out to dinner every night. The location is second to none! We could walk everywhere! The pool and beach is beautiful! Many times during our stay we were the only ones in the pool! Jason has a closet full of pool floats, boogie boards and comfy cushions for the beach or pool chairs. The kitchen is well stocked. I can't think of a single thing that is needed for a small or large group! The washer and dryer was used every night for the beach towels. It was so nice to throw in a couple of loads of clothing the morning before our departure! We hope to be back a third time next year to experience all that Ixtapa has to offer! Don't hesitate to book this unit! It is lovely in every way! We had the pleasure of staying at Casa Nova for a week with our 2 sons and their families. The first day we arrived, Eddy, one of the security guards, had some baby sea turtles the grandkids were able to help release. What an awesome experience for them! The casa had plenty of room for our family of 9. The kids had plenty of room to play. The kitchen was well equipped, the beds were all very comfie, and the views were breathtaking! A bonus were all the beach toys and pool toys that were there for our use. Jason, the owner was super easy to contact and answered any and all of my millions of questions right away. Claudia, the property manager was also available whenever we needed anything, If you are looking for a great place for a family vacation, I highly recommend Casa Nova. Thanks for sharing your piece of paradise with us. We will cherish the memories😎�👍�🏼�! It was our pleasure to host such a wonderful family. Thank you for choosing CasaNova and we look forward to having you again. What you see is what you get! The view is breathtaking! We had 3 couples in our group and we had plenty of personal space. Having a bathroom with each bedroom was perfect. Very clean and comfortable. The property manager was very helpful and responded quickly when contacted. Having access to little shops, restaurants and bars in walking distance was key. Tasty food and great atmosphere where ever we went. I would recommend this property to friends and family members. The owner also checked in on us to make sure everything was going well which was a nice touch. Shows he truly cares about his property and how we were being treated. We would recommend the Blue Shrimp for their Mojitos and melted cheese with Chorizo....Yum!! Also recommend reserving to have a cook come into your condo and cook meals. That was delicious!! We hope to be back to visit in the future! Thanks again for having us! It was our pleasure having you guys as our guests. We're so glad our unit exceeded your expectations. Thanks you for sharing your review with us and we look forward to having you back again!. Jason, the staff and the Amara community of owners, all made the experience one of the best we have ever had. Casa Nova is as good as it gets. Thanks Jason , from all of us for a truly wonderful experience! Thanks Dave! Hope to have you guys back again. We really enjoyed our stay at the Amara. Jason was great to work with and responded quickly to our inquiries. He gave us a lot of information about the condo and local area. The condo was very clean and very comfortable. It had everything you needed for our stay. This was our 5th time to stay at the Amara and have never been disappointed. The staff is very accommodating and friendly. It is a very secure building and we always feel safe when there and out shopping and eating at all the wonderful restaurants. We enjoyed just relaxing on the beach and enjoyed the beautiful sunsets. Can't wait to get back to Ixtapa! Thank you Nora for being wonderful guests. It was a pleasure having you stay in our unit. We look forward to having you again. The resort fee (often called the bracelet fee) is 300 pesos per person, per stay fee and is charged in Pesos. It is NOT INCLUDED in your rental price or rate. For example: If 4 people are staying in the condo, the total resort fee will be an ADDITIONAL $1,200 PESOS total (4 x $300 Pesos) and will be due at check-in and payable to the condominium association administration.